Preston Bissett Nurseries and Country Shop: Plants For Hardy Containers And All Year Round Interest. 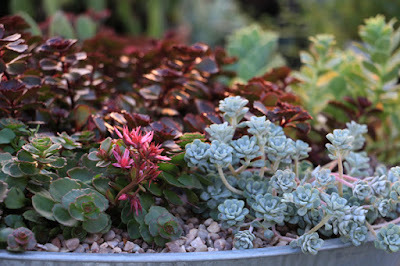 Plants For Hardy Containers And All Year Round Interest. This is one of our real Yorkshire flower pots. I've used ericaceous compost which has allowed me to include some lime hating plants that don't fair too well in my limey borders. I've placed Skimmia Rubella in the center as the buds and the height balance the pot. Around this I have 3 dark red heuchera and 3 calluna heathers. The bugandy reds and rose pink shades merge together in harmony. 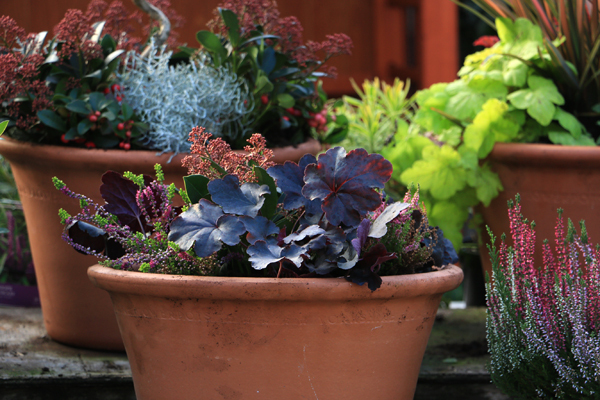 Pots don't have to be an eclectic mix of perfect plants. Some pots particularly these frosy blue jar shaped glazed pot lend themselves to a singular well chosen plant. 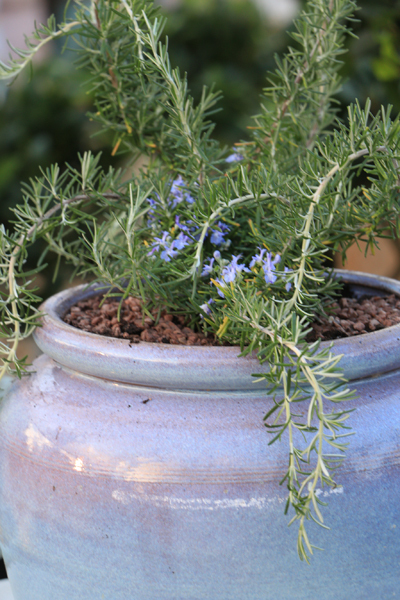 This blue flowering evergreen prostrata rosemary tumbles perfectly out of this pot. 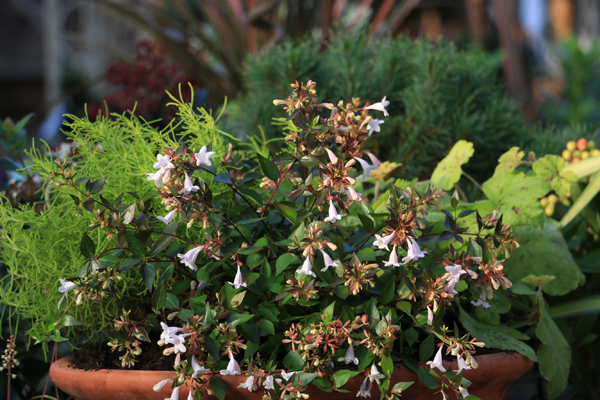 Sage can also look very attractive in this shape pot. Herbs are wonderful for pots. 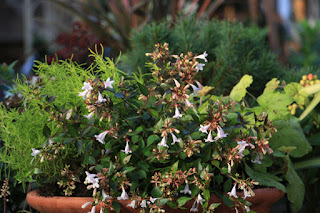 I love to plant small herb collections of sensory scented useful culinary herbs such as thyme, rosemary and sage. Frequenly I use them as under planting for a a tall or small single stemed lollypop bay. Pots as I mentioned earlier are an excellent opportunity to enjoy plants that may not otherwise suvive in the soil in your borders. Plants such as rhododendrons, azalias or pieris. Small collections of coloured evergreen can look very appealing .Placed in a collection together. They can often make a very dramatic display. I throughly recomend including Daphne odora 'Marginata' and sarcococca because as well as being good evergreens they smell delicious. I want the fragrance to lift me up every time I pass up my front path. 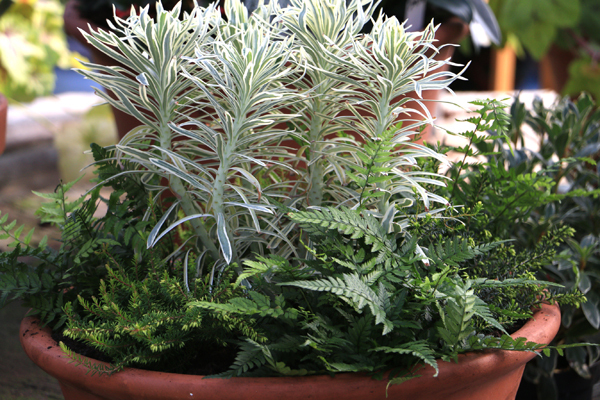 This pot is a simple collection of 3 limey green evergreens in one pot. Santolina Cotton Fizz, a floweing abelia and a tumbling Heuchera Yellow Stone Falls. The latter making a fabulous tailing plant. Here is an example of texture. 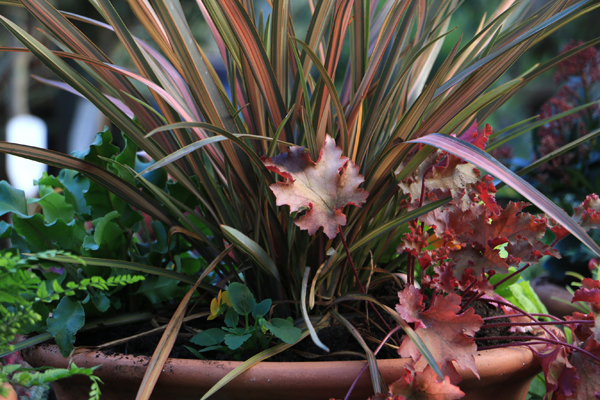 The spikey rusty margined phormium makes a tall shapely center. Far more interesting than the usual cordyline. 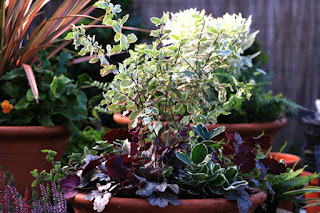 It bends beautifully with Heuchera Marmalade, a hearts leaf evergreen fern and another Yellow Stone Falls Heucherella. Small apricot violias merge between the evergreens. This pot is dominated by a small silver leaved pittosporum and under planted with a variety of small silver euonymus and frosted red leaved heucheras. Alpine containers or bowls and sinks don't give you any height but placed on the door step or a garden table or feature spot can be just perfect. Mix half Rose Tree and Shub compost with Aline Grit and plant. Sprinkle some grit around the alpines when you fnish. I love the grey flushed Stone Crop in this large metalic bowl.